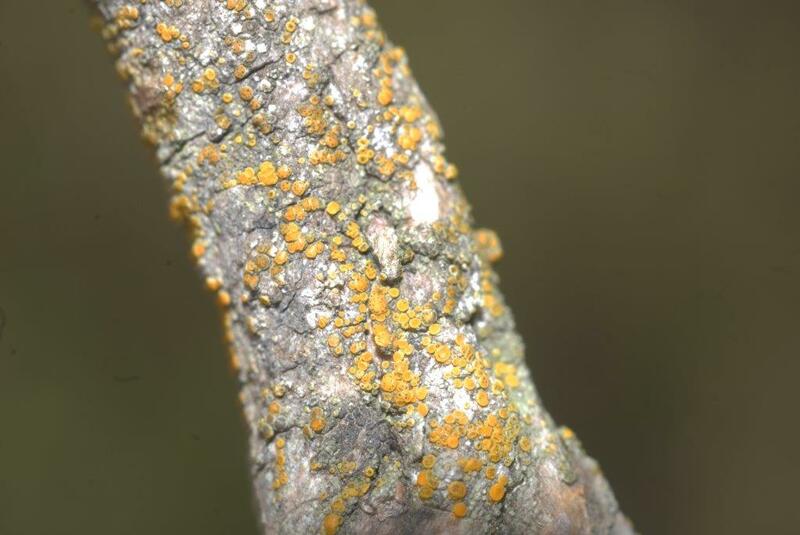 Caloplaca suaedae. This species has only been found on the stems of Suaeda vera by Chesil Beach where it was seen by PSL members in 2015 when this photo was taken. Otherwise it has one site in Norfolk. It is like Caloplaca oasis, but has a thicker, areolate thallus. It should be noted that there may be other species present on Suaeda vera stems. The black dots on the apothecia are the lichenicolous fungus Lichenodiplis lecanorae. It has been looked for personally on Suaeda vera in East Sussex, but though a Caloplaca was found, that could be a new species, no Caloplaca suaedae was present in any collection made. It is still reckoned to be endemic.